Empirical data is one thing, but what is needed for developing policies are predictions. Predictions are based on models and their limitations are obviously: what we know about the real world, what we can measure, and how we can transpose them into computer code. Models are not, and never will be, the real world but they are never-the-less essential and seductive. There is a gap in climate predictions. It is between the annual and decadal. If scientists could make seamless predictions from weather forecasts over a few days, through seasons to annual and decadal timescales they would be in a far better position to influence policy. But as it is, it almost seems that weather forecasts and short-term seasonal forecasts are a different type of animal than decadal forecasts. Establishing what some call a “seamless climate service delivery system,” has been called one of climate science’s grand challenges. “There is a lot of work still to do, but just as weather forecasts became a regular operational activity in the 20th century, we are now approaching a similar point for near term climate predictions and these are now being made at a number of scientific institutes worldwide,” says Professor Adam Scaife, jointly from the University of Exeter and Met Office and a lead author on the study in Nature Climate Change. Some believe that near-term predictions have been vindicated by what are called retrospective predictions or hindcasts. Modelers of all disciplines will readily tell you that the past and the future are not the same, for the obvious reason you have to wait for the future. Success in hindcasting is no guarantee of success in forecasting. The only thing that works is to make a prediction and wait to see how good it was. 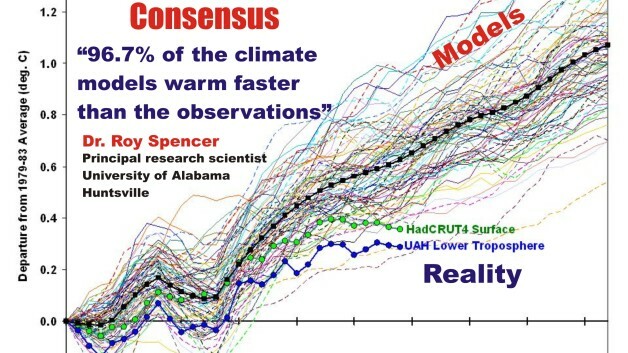 Looking at the projects to compare climate models with real-world data shows that climate predictions are difficult, and that they are inaccurate. That is the lesson from the 5th round of the Climate Model Inter-comparison Project (CMIP) . CMIP6 is not very encouraging. It will inform the AR6 report of the IPCC in 2021. It’s just at the start but so far it is repeating the problems of CMIP5 in running too warm.